My roaming itch is easy to scratch. I don’t have to travel hundreds of miles to feel like I have been fishing. Instead, I like to focus on lakes that are relatively close and are within an hour’s drive. In a normal winter on the ice, that usually translates into 15 to 20 bodies of water. Learning to fish a variety of lakes can be an enjoyable part of the fishing experience. Although I do throw in a few new lakes to my repertoire each winter, I primarily go to the same water each year. This gives me a chance to generate a basic knowledge base on a particular lake and increases my chances for success when I do return to a body of water. 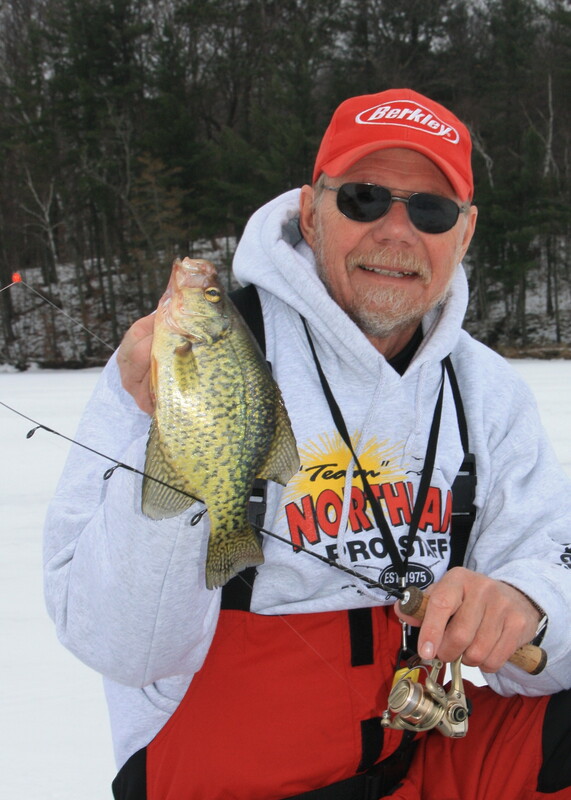 There are several facts I have learned while working panfish on my milk run of lakes. One of these is the concept of repetition. Panfish, especially those that are suspended over a deep basin, have a tendency to show up in the same locations year after year. Undoubtedly, there are fluctuations in the population of catchable fish. Panfish, especially crappie, are quite cyclical in nature and can go from a big year class to nothing in a short period of time. The opposite is also true. Fishing pressure also has an impact on panfish populations. There have been winters when the bite has been consistent for extended periods of time on a particular lake. During these long stretches of activity, a population of respectable fish can be decimated over the course of a winter. It can actually take a couple of years for one of these lakes to recover. There are some important tools involved with locating and catching fish on many different lakes. The first ingredient for success is having a quality lake map and GPS. I have come to depend greatly on LakeMaster products (www.lakemap.com) to help guide me to fishing locations. Once I do find a spot, you can be sure it will get saved as a waypoint. Even though fish may not be located in the exact spot every time I head to a lake, having a starting place to look is extremely valuable. I find it astounding how often fish are found in the same general vicinity year after year. This is especially true of deep basin fish. Another tool that is absolutely critical is a sonar unit. If you are fishing where there are no fish, you cannot catch anything. It is that simple. Sonar units, such as the Vexilar I use, are extremely important when working through the fish location process on different lakes. If you are not certain where the fish are going to be, it is absolutely critical you have some idea of what is under the ice. This includes weeds, depth, bottom hardness and of course, fish. None of this “looking” process can be accomplished unless you have a way of getting a reading to the bottom. Many times this translates into drilling a hole every time you want to check things out. Whenever possible, I try to avoid drilling holes until I am ready to fish. Usually, I find that by kicking away the snow and pouring a little water on the ice, I can get my Vexilar to read through the ice to show me what is happening underneath. I only drill holes after I find fish or an area that needs better bottom definition. Fishing different water throughout the winter period has always been something I enjoy. As a general rule, fish are somewhat predictable and are frequently found in the same locations year after year. Spending the time to locate new fishing hotspots and checking out the old ones is an enjoyable part of my winter routine.